With the extended winter weather we experienced in March, the stink bugs stayed in for a little longer. But with the beautiful weather during this second week of April here in the Greater DC area, the stink bugs have finally emerged. I got home today and our bathroom door was locked and my wife was insisting I do something to fix the infestation. I’m sure I’m not the only husband out there being given this task today, so, I thought I’d offer a few tips on what you can do when a stink bug invasion has already occurred. 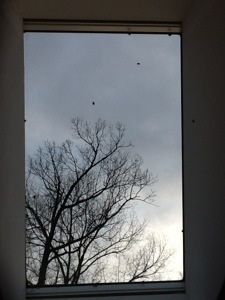 A picture of our skylight covered with stink bugs. Don’t use pesticides in the house to control stink bugs, it’s just not effective. It will cause other problems if you do, because the dead stink bugs will attract mice, carpet beetles and other pests to your home. Use a vacuum, preferably one that can be emptied as soon as you vacuum them up. If you have a vacuum that uses a bag don’t let the bag sit with the stink bugs in it, it could start to stink. Preferably use a shop vac or a bagless vacuum and remember to empty it after each use, I prefer to empty it into the toilet rather than outside so they can’t reproduce. Seal up your home, but wait until summer, you don’t want seal your house up while they are still in it because then you end up with dead stink bugs in your home. In June or July calk around windows and doors, around outlets and fixtures outside, make sure your soffits are closed up and any vents have screens. Treat the exterior of your home to kill exiting stink bugs in the spring and keep them from reproducing in your yard. Then treat in the fall to prevent entry of stink bugs into your home. In the fall If you can keep stink bugs from congregating on the walls of your home they won’t release a “herd” pheromone that causes the walls to be covered by a blanket of stink bugs as you have probably seen before. Unfortunately stink bugs are here to stay and there is no quick fix. If you have them in the house right now the vacuum is your friend, but if you use some of these tips hopefully your problem will be drastically reduced come this time next year.